NASA needs to return astronauts to the moon under current plans, NASA has picked the wrong destination with the wrong rocket. A test-flight version of the rocket, the new Ares I, is on a launch pad at Cape Canaveral, awaiting liftoff later this month for its first experimental flight. Instead, NASA should be concentrating on bigger rockets and new places to explore, the panel members said, as they issued their final 155-page report. The committee, created by the White House in May to look at NASA’s troubled exploration, shuttle and space station programs, issued a summary of their findings last month, mostly urging more spending on space. On Thursday in a news conference, panel Chairman Norman Augustine focused on fresh destinations for NASA, saying that it makes more sense to put astronauts on a nearby asteroid or one of the moons of Mars. He said that could be done sooner than returning to the moon in 15 years as NASA has outlined. The exploration plans now under fire were pushed by then-President George W. Bush after the 2003 Columbia space shuttle disaster. The moon-Mars plan lacks enough money, thanks to budget diversions, the panel said in a 155-page report. Starting in 2014, NASA needs an extra US$3 billion a year if astronauts are going to travel beyond Earth’s orbit. The Augustine commission wants NASA to extend the life of the space shuttle program and the International Space Station. Space shuttles are due to retire Oct. 1, 2010, but should keep flying until sometime in 2011 because they won’t get all their flights to the space station done by that date. And the space station itself — only now nearing completion — should operate until at least 2020, allowing for more scientific experiments, part of its reason for existence. NASA’s timetable calls for plunging it into the ocean in 2015. However, the overall focus of the panel’s report is on where U.S. space exploration should be headed. The White House will review the panel’s analysis and then ultimately the president will be making the final decision, White House spokesman. The committee outlines eight options. Three of those involve a “flexible path” to explore someplace other than the moon, eventually heading to a Mars landing far in the future. The flexible path suggests no-landing flights around the moon and Mars. 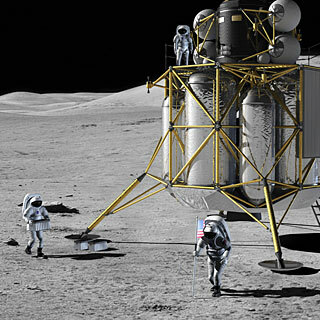 Landing on the moon and then launching back to Earth would require a lot of fuel because of the moon’s gravity. Hauling fuel from Earth to the moon and then back costs money. It would take less fuel to land and return from asteroids or comets that swing by Earth or even the Martian moons, Phobos and Deimos, Augustine said. Eventually, Augustine said NASA could return to the moon, but as a training stepping stone, not a major destination, as the Bush plan envisioned. Next Next post: Comic book and costume to crisis.